According to McKinsey*: The average interaction worker spends an estimated 28% of the workweek managing e-mail and nearly 20% looking for internal information or tracking down colleagues who can help with specific tasks. Is this how it should work? Shouldn't employees actually focus on the core tasks, instead of the administration part? Read the following tips and learn what can you do to increase the effectiveness of your work and get more things done in shorter time! What can you do to become more productive at work? Make a to-do list. Split big projects into multiple smaller tasks and prioritize them. It will help you in better time management, stay focused and increase your motivation by accomplishing smaller goals. Connect with your team. Regardless if your team shares the same office, or works remotely you need to stay in touch. Using a shared platform can tremendously improve the communication flow and help you to find info and input you need much quicker. If you’re stuck, their input can be extremely inspirational and help you get your work up to speed. If needed, ask for help as well! Assign and delegate tasks to particular people. There’s no better way to avoid chaos and duplicating work in a project than assigning team members to tasks. It brings more organization in work, as well as better motivation for the employees, who will feel more responsible for the job they are supposed to do. Do not organize meetings about something that can be part of the day to day workflow, like meetings on the status of a project. If you do need a status meeting do it standing up and reserve only 10 minutes for it. 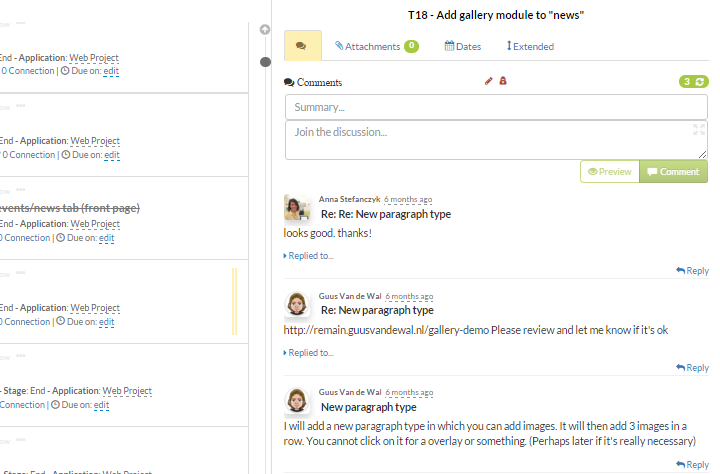 You can easily get an overview of who’s doing what from a collaboration tool. Take small breaks to remain focused and improve concentration. Even a short break can help you to clear up your mind and find inspiration for your work. Work smarter not harder! If you’re still not using any work management tool, perhaps it’s time to think about a change? Switching between excel sheets, email clients, development tools results in distraction and causes downtime. Collaboration software allows you to keep all the project data and communicate with your team within one application only. It’s much simpler and faster to find project requirements, input from colleagues or related documents in one place. If you’re a software engineer, a collaboration software such as Gravity can even help you in starting a change/build process within your development tool. In the short term learning a new tool might result in a bit of downtime, but once you get acquainted with new software you will take the most of its benefits and will not be able to imagine your work without it anymore. Look for solutions outside your workplace, network. Internet, discussion boards or user group meetings and conferences are a great source of inspiration. What do we do at Remain? At Remain Software, we also do our best to maximize our productivity. We use Gravity to manage all our projects: from development, helpdesk up to coordination of marketing and sales activities. All communication, including communication with customers and partners goes through Gravity. Read what our employees have to say about the tool they use. Email is a productivity killer! I really enjoy the fact that with Gravity I don’t get nor send any CC and BCC emails, because all people involved can communicate within the system. Using Gravity gives me quick overview of the issues assigned to me (and my colleagues) and the priority of these issues. So it is always clear for me what to do next. Using the comment function turns out to be a nice way to keep track of changes done so far. I am using our workflow solution to get an overview of all the things that go on in the company. Gravity is sending me a mail so that I do not have to be in the workflow solution all day. I can also choose to get popup notifications but that has proven to be a concentration killer. So I check my mail between code rushes and this works very nice for me. What I find is that it is important to provide a good description of the problem so that it makes sense to others. The thing that I always ask myself when I type in a problem description or a requirement: "If I read it tomorrow, can I still understand it?" This rule of thumb is a great tool in my daily work. Gravity is of great help to include marketing actions in the development cycle of our company. I know the exact status of the product development and how to incorporate my marketing calendar into it. It’s also extremely useful to communicate with external stakeholders, such as for example webmaster. I can’t imagine launching the new Remain Software website without using a communication & collaboration tool. It made my work way much more organized and saved me a lot of time – no need to search emails, check task status, etc. * Excerpt from “The social economy: Unlocking value and productivity through social technologies”, July 2012, McKinsey Global Institute, www.mckinsey.com. Copyright (c) 2012. McKinsey & Company. All rights reserved. Reprinted by permission.